Well the markets finally got what they waited 1 year for. On Wednesday Janet Yellen & Co unanimously decided to hike interest rates for the second time in 10 years. On top of that the Fed indicated they would raise rates 3 times in 2017, and the dot plot indicated the Fed expects rates to rise into a range of 3.5-4.0% by 2019. The outlook has sent US bond yields soaring as the 10 Year Treasury hit a high of 2.6% for the week. I'm not sure how much more upside is left. Eventually the bond market will digest gains before continuing it's move up. After years of keeping rates low to stimulate growth it seems there is suddenly a big urge to hike rates in a consistent manner. Funny is I don't think a lot of people "believe" the economy is strong enough. Most people still feel left out and behind in what's been one of the most controversial recoveries since the Great Depression. Either way if the Fed's path turns out to be true that should continue to be a tailwind for the US Dollar which has seen a substantial rally the last few months. Non-OPEC members agreed to a 558k bpd production cut to help stimulate prices. The oil markets initially reacted with a strong surge, but then quickly calmed back down for the week. I must say I love how these countries get to collude against the entire world, and no one does a thing about it but continue to buy more oil. Oil is still in a long term downtrend from the way I see it. So I'd like to see how this continues to play out. I'm not concerned one bit about overall energy prices. There is a seemingly never ending glut of ways to provide our energy needs in the near term horizon. Besides the abundance of coal, natural gas, and oil we also could ramp up the increasingly less popular nuclear energy systems. On top of that there have been great strides in the past few years with wind and solar energy. I could easily see energy prices continuing to fall in the decades ahead as energy producers of all types continue to fight for our money. It's kind of nice how our investing style doesn't generate many action items, or news to pay attention to. It allows me to spend my time getting other productive things done. The portfolio had a quiet week with no earnings announcements, or other major news. 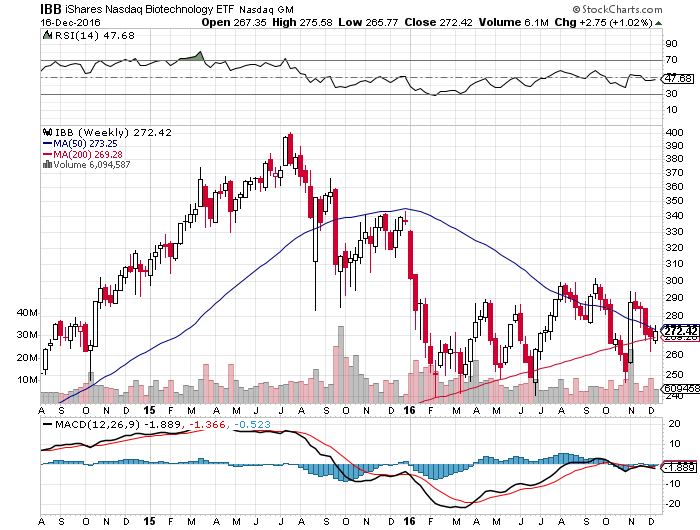 The IShares Biotech ETF(IBB) seems to be the only thing constantly being talked about as this politically sensitive sector is the subject of never ending whiplash lately. On top of that a few holdings had some bad news lately which have kept share prices under a lid. From a technical standpoint the ETF is sitting in a precarious position right now as it straddles the 50 and 200 day SMA's. If things don't start looking up for this sector soon it may test my patience for than I'd like. The one bright spot from the chart is the ETF is doing a decent job of holding up against it's previous lows and making marginally higher highs. It's not a perfect chart, but I've seen plenty of companies and industries overcome less than stellar chart action. Hopefully this sector can continue to create lifesaving drugs, and rewards shareholders with the profits. The tobacco sector has been lagging of late, and I think a lot of that was due to the impending rate hike and prospects for higher borrowing costs in this leveraged industry. Besides RAI and BTI merging the sector has been quiet as it moves sideways for the most part. Also it remains to be seen if British American Tobacco will increase it's offer for Reynolds America. I'm partially skeptical, but you never know. The industry has seen an uptick in the movement to curb e-cig use. That's expected. It was nice to see our tobacco/real estate play, Vector Group(VGR), waking up with a 9%+ move the last two weeks. It looked like the stock was sleeping during the ensuing Trump Rally. I was starting to wonder why the stock wasn't moving since the real estate sector overall had seen a decent post-election bump. There was no major news out of our other stocks. We are light on retail except for Costco(COST) so we don't need to pay attention to holiday trends very much. Although the companies last earnings report was very good in my opinion especially when other retailers are considering curbing expansion, or actually closing stores. Cummins(CMI) has seen a big boost to it's share price lately as it's trading around $140. Crazy to think less than a year ago the company was going for $80. I really regret not adding. Oh well. Engines aren't going anywhere soon. And this company makes the best ones in the world while being a cutting edge producer of cleaner, stronger, and more efficient engines. Since I've been slacking lately I'll do one last review next week, although expect it to be abbreviated. After that I won't be back on a regular schedule until mid-January. The blog will still get it's periodic updates so be sure to keep checking back in. I'm looking forward to calculating the year end results to see how the portfolio stacked up against the S&P 500. This quarter won't be an easy beat so I'm really anxious to see how this turns out. Enjoy all the end of year has to offer. Time with family and friends, and a variety of festivals, should be more than enough to keep us all happy the next few weeks. The boost to our portfolios is just a nice bonus in my opinion!